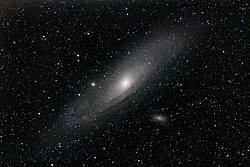 In this image of the Andromeda Galaxy, Messier 32 is to the left of the center. Messier 32 (also known as NGC 221) is a dwarf "early-type" galaxy about 2.65 million light-years from Earth. It is seen in the constellation Andromeda. M32 is a satellite galaxy of the large Andromeda Galaxy (M31). It was discovered by Guillaume Le Gentil in 1749. M32 measures 6.5 ± 0.2 thousand light-years in diameter at the widest point. The galaxy is a compact elliptical galaxy type. Compact ellipticals are rather rare. Half the stars are inside an effective radius of only 100 parsecs. Densities in the central area increase steeply, over 3×107 M⊙ pc−3 as seen by the HST. The half-light radius of this central star cluster is around 6 parsec. In other words, this small centre of the galaxy emits half the light of the central 100 parsecs. M32 contains a supermassive black hole. Its mass is between 1.5 and 5 million solar masses. ↑ Kent S.M. (1987). "Surface photometry of six local group galaxies". Astronomical Journal 94: 306–314. doi:10.1086/114472. ↑ Mateo M.L. (1998). "Dwarf Galaxies of the Local Group". Annual Review of Astronomy and Astrophysics 36: 435–506. doi:10.1146/annurev.astro.36.1.435. ↑ Lauer T.R. et al (1992). "Planetary camera observations of the central parsec of M32". Astronomical Journal 104: 552–562. doi:10.1086/116254. ↑ Kepple, George Robert; Sanner, Glen W. (1998). The Night Sky Observer's Guide. Vol. 1. Willmann-Bell. p. 17. ISBN 0-943396-58-1. ↑ Rudenko, Pavlo; Worthey, Guy; Mateo, Mario (2000). "Intermediate age clusters in the field containing M31 and M32 stars". The Astronomical Journal 138 (6): 1985–1989. doi:10.1088/0004-6256/138/6/1985. ↑ Armando, Gil de Paz et al (2007). "The GALEX Ultraviolet Atlas of Nearby Galaxies". Astrophysical Journal Supplement 173 (2): 185–255. doi:10.1086/516636. ↑ Tonry J.L. (1984). "Evidence for a central mass concentration in M32". Astrophysical Journal Letters 283: L27. doi:10.1086/184326. This page was last changed on 14 June 2018, at 10:58.